This week, Estonian Olympic Committee launched the campaign ‘TOGETHER – Our Champions’, which celebrates athletes who won their national championships titles in 2018 – on the 100th anniversary of Estonia. 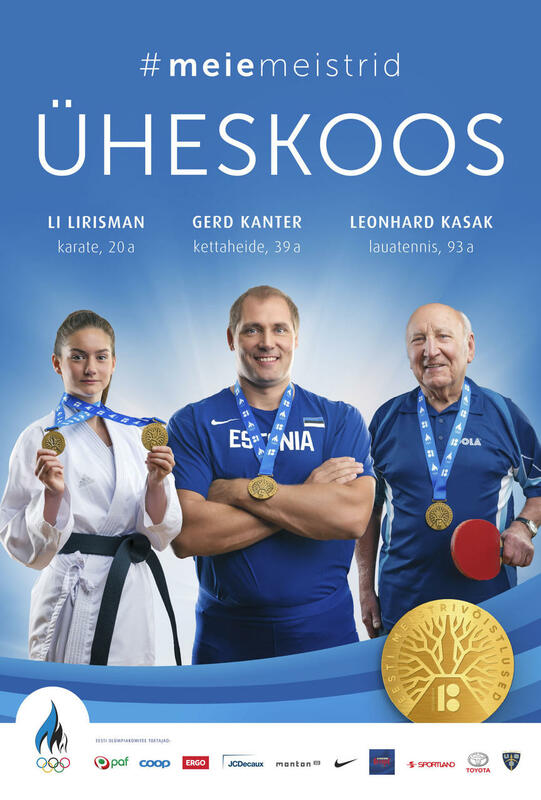 The focus of the campaign is on the unique national championships medals designed especially for the Estonian centenary, and in total over 22 thousand medals will be awarded to athletes of all sports at Estonian championships this year across various age divisions. According to Aivo Normak, the media project manager of the Estonian Olympic Committee, it is a unique occasion for the medalists of national championships in all sports to be receiving identical medals. “These special medals are the present of the NOC and Estonian sports community to Estonia on the occasion of the country’s hundredth anniversary. Winning a medal at national championships is an emotional event for any athlete, but the special championships medals celebrating the country’s jubilee add even more glory and will be a reminder about this special year and victory to tens of thousands of Estonians. Most of the medals have already found worthy owners and are displayed in places of honor in the champions’ homes. These medals unite everyone who has reached and will make it to the podium this year. Regardless of the sport, discipline and age, our athletes love sport together, compete for Estonia together and proudly wear the medals together,” Normak said. The Estonian championships medals that are awarded in 2018, have been designed especially for the centenary year. 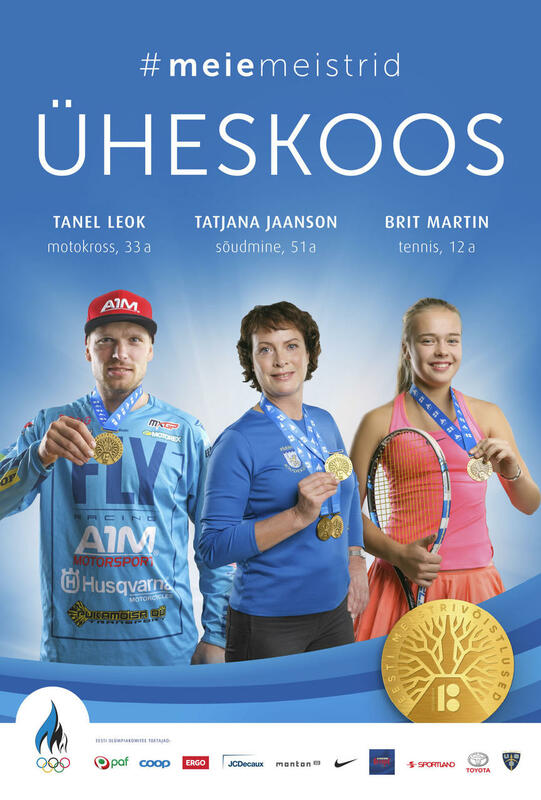 This is the first time that all medalists of Estonian championships from all sports receive the same medals, accounting for more than 350 championships in all sports and various age categories, in total over 22,000 medals. The design of the medals was chosen in a nation-wide vote, which was in favor of the design depicting a motif of Estonia’s national tree - the oak, symbolizing national character, traditions and continuity. For discus throw Olympic winner Gerd Kanter, who is also head of Athletes’ Commission of European Olympic Committees and Estonian Olympic Committee, this year’s Estonian championships medal is very special and valuable. “I believe this will be my last Estonian championships medal in discus throw. It also stands for the national record in men’s discus throwing, 12 Estonian champion titles, so it is very special and important to me in every way. Competition has always been strong in men’s discus in Estonia, and the title has never been easy to secure. I have not been the Estonian champion in recent years, but this time it was a success and I am overjoyed. This is why being a holder of 12 titles is a value of its own. Most athletes have noted that jubilee championships medals are special and beautiful, and all the winners are certainly proud of receiving this medal,” Kanter said. The European epee fencing champion Katrina Lehis won her first Estonian championship medal this year. “The champion title means a lot to me. This medal is worth winning if only for its beauty. It was also my first national championships after having a child, so this medal is indeed extremely important,” Lehis commented. Another Estonian champion this year is MXGP rider Tanel Leok. “I have not been able to take part in many national championships, but I have been trying to do it in recent years. The older I get, the more important these titles become. The young are catching up, and, although this year’s victory was more or less secure, it was certainly not easy and demanded effort. This medal looks good, and I like it!” Leok said. For rowing veteran Tatjana Jaanson, who won two jubilee championships medals, 2018 has been a special year. “Of course, the medals issued to celebrate the anniversary of Estonia are special, and rowers were especially keen to win them. I am very pleased to have won one among veterans, but it is especially important that I was rowing in a coxed eight with my daughter, and we won. This makes me really happy,” Jaanson shared. Leonhard Kasak, the 93-year-old Estonian champion in table tennis, said that this medal was especially significant for him. “Because you can win such a medal dedicated to Estonia’s 100th anniversary once in a lifetime. The next will be the 200th jubilee, but you have to live to see about that!” Kasak laughed. The European U21 karate champion Li Lirisman became a national champion twice this year. “These two gold medals are very important for me, it is the country’s 100th jubilee. This year I became a European champion, and it was something of a present from me to Estonia. Now it is as if Estonia gave me a gift of these two gold medals,” Lirisman said. Virgo Karu, the Estonian veteran’s champion in cycling, noted that the jubilee championships medal is one of the most beautiful his collection. “The championships medal is very important because it comes from the national championships. The design is exceptionally beautiful and created especially for this year, Estonia’s 100th birthday, and it is the only year you can win it,” Karu said. 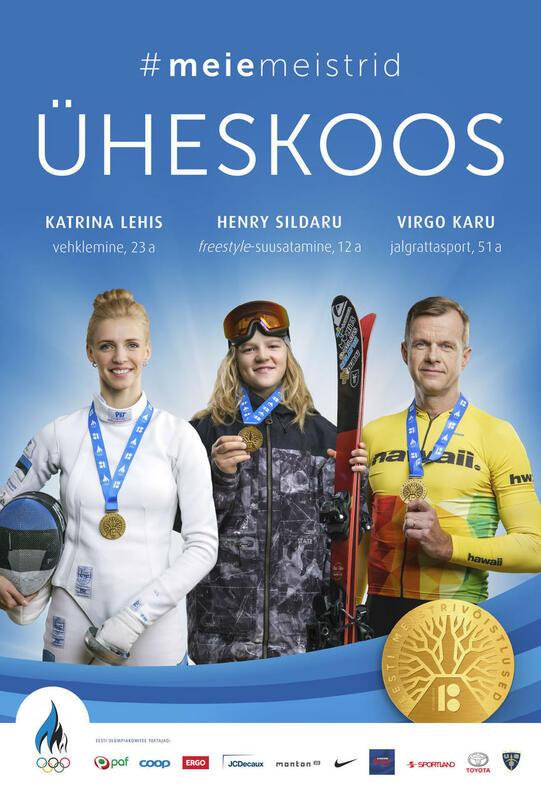 The campaign also features young Estonian champions freestyle skier Henry Sildaru and tennis player Brit Martin. The campaign ‘TOGETHER – Our Champions’ was devised by the Estonian Olympic Committee. The design author is designer Mauno Meesit from BrandOn Design, and the photos of athletes were taken by photographers Herkki Erich Merila and Lilian Merila. The author of the medal issued to celebrate the 100th anniversary of Estonia is the creative agency Identity, the designer partner in “Estonia 100” projects.